If you love cats but have a small space, there are ways to live with your furry pet in harmony without the mess or the smell that comes along with the litter box, especially in a small apartment. No this doesn’t mean follow them around the house and document their every move, but really check on your cat when it comes to litter use. Does he spray the litter all over the place? … or does he dig to the other side of the world until there is a completely bare spot to do his business. Does he like privacy? … or maybe he doesn’t care who is watching. I personally have always found the typical cat litter box, to be an awkward shape and takes up room. 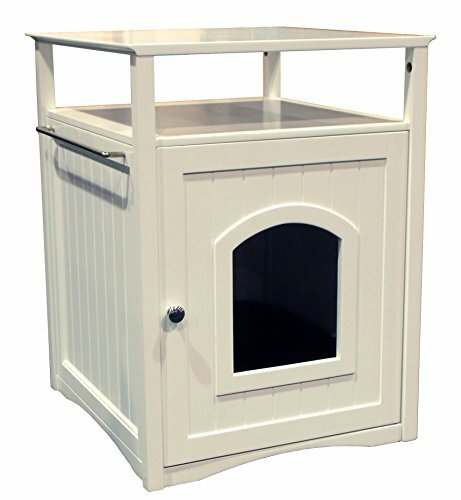 You don’t want to put it against a wall or he can’t get in, and many of the boxes have rounded corners, so I came across this corner unit that just doesn’t take up the same room, and is covered with a center hole for him to enter and leave which keeps the litter inside, and just doesn’t take up as much room. You could use this in the hallway, bathroom, bedroom, anywhere there is a free corner. This is hiding it in plain sight! In other words, it actually becomes part of the décor with the faux plant. This can then sit in the living area or hallway, be pleasing to the eye, and your cat can do his business inside and this will help to hold in the contents and the odors. If you have other floor plants you could clump them all together and make it fade in, or simply sit it in a corner to look good. I do make a point of using clumping litter myself and quickly clean it out every day so this will stop odors from building. I have a container with a lid that I keep nearby to house the used litter until garbage day, this too will keep the smells down. I try to make it a habit each evening. Petsfit Assemble Odorless Night Stand Pet House/Litter Box Furniture with Latch Holding 19.6" x 23.8" x 21.8"
Night Stand or End Table - Double Use! If you have a small space, then making the furniture do “double time” is one way to deal with the litter. 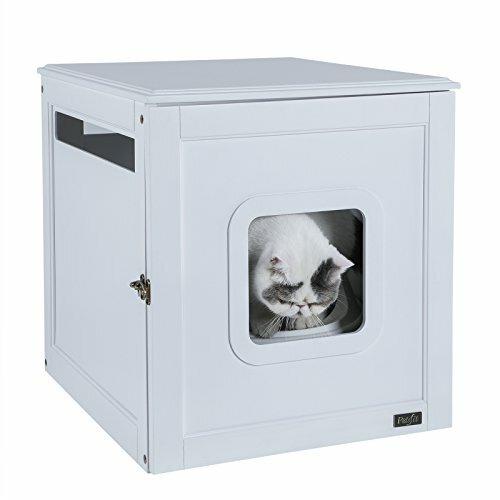 As you can see with this unit, the cat can get in and out and it also doubles as a table surface for the bedroom or the living area. Great for magazines, a lamp, or as a coffee table, you don’t have to hide the box because it is simply part of the furniture and is pretty neutral in color. Really easy to clean by simply opening the front door for easy access and it looks good. If your cat has a serious problem with tracking the litter contents out into the main living area, you may want to consider a top entry style. As long as your cat is agile (not the best solution for old cats!) they simply go in through the top. This way you don’t have to leave room around it for entry. It can fit into a tighter space and is easy to clean out. It comes with a scoop and a reusable tarp liner for disposing of the contents. Most cats get used to this right away as they love to climb and explore. 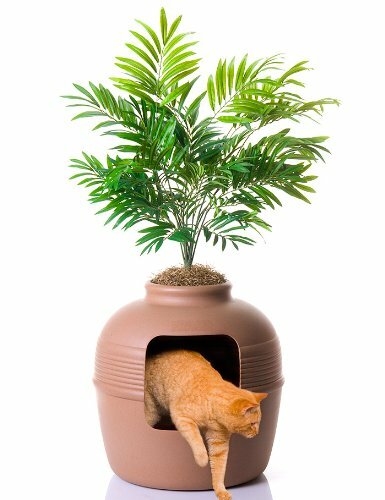 They will definitely get privacy, so this would be great for a shy cat who doesn’t like people watching. 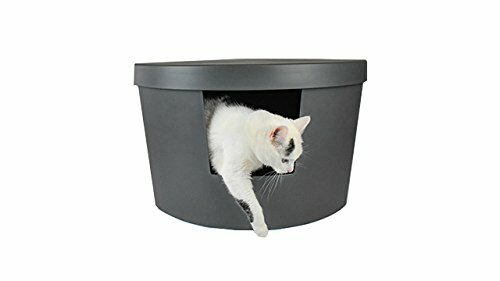 This can be used as a good looking cat toilet as well as a place to hang out if you put a cat cushion on the top, or you could make it double time usage by using the rest of the unit for something necessary in the apartment as in the picture. It can be an end table in any room, or in the bathroom as shown, but you could also dedicate it to the cat by creating a great place for them to relax on top, could sit against a wall. When trying to live in harmony with your pets, you have to have a place for everything, especially if that place is a small apartment. You have to be considerate of the cats need for privacy but at the same time every inch in your place is valuable real estate right? Hopefully the above have given you some ideas, personally I am loving the corner unit, as it is easy to find a spare corner and this fits better and takes up very little room. Or you can hide it in plain sight, with the faux plant or the end table idea. 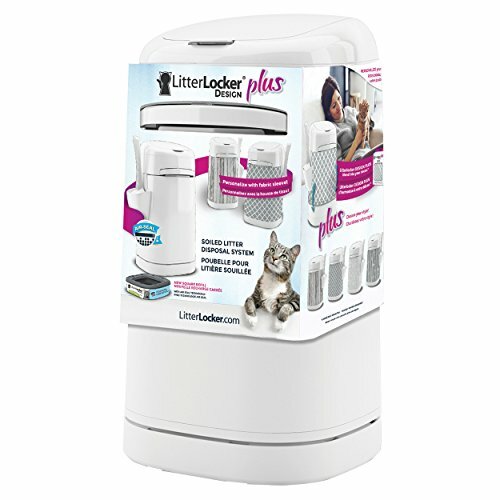 Used Litter Locker - Don't Be Assaulted with the Waft of Odors! 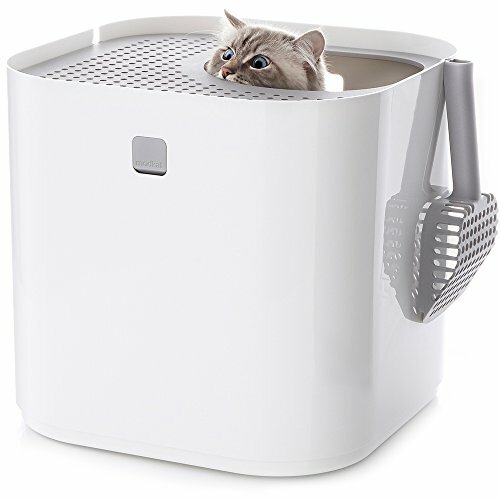 Well it is great that you may have the solution for a small apartment cat litter box, but now what to do with the used contents? You literally scoop in the used contents, and then pull a spring loaded handle and this will store it in the next section, this way the odors are locked and sealed so that every time you open it you are not assaulted with a waft of odor. In a small apartment odors can get out of hand, so by having a system in place such as a good litter box that works for your small space and a place to store it until garbage day keeps your place clean and odor free. This way you can live in harmony with your cat or cats. Think of the layout of your space, and the daily activities, and then consider which style would work best in your apartment. You don’t want to be tripping over it, and I am personally not a fan of it in the bedroom, but any other room can work. These are designed to limit the usual mess that comes along with cat usage. You don’t have to stick with that simply rectangle awkward open litter box, where you had to leave at least 5 feet around the entire thing just to deal with the mess. Find an enclosed one as above and make your life so much easier! If you know your cat’s way of doing his business it can make it easier to choose the right toilet for him or her. If you are going to live in harmony together, you don’t want to be walking barefoot through tossed litter or get to stare at it if maybe like my cat; he is not big on burying it. You want to be able to clean it easily and not have the smells associated with a cat.